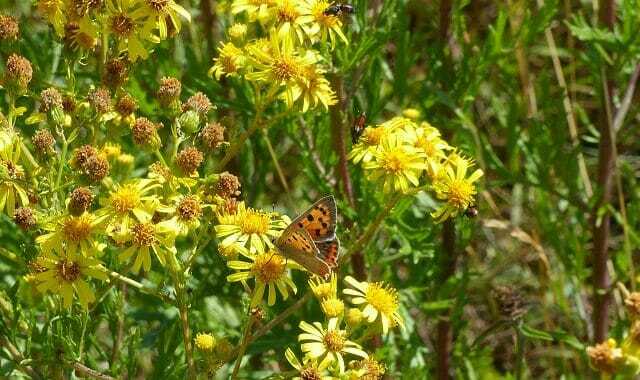 Ragwort is a plant that has its supporters and its opponents. It is true that it’s poisonous, as are many wild plants, and like many poisonous plants it has a bad taste, so animals tend to avoid it. The problems arise if it’s mown, ending up in hay used as fodder for cattle and horses. 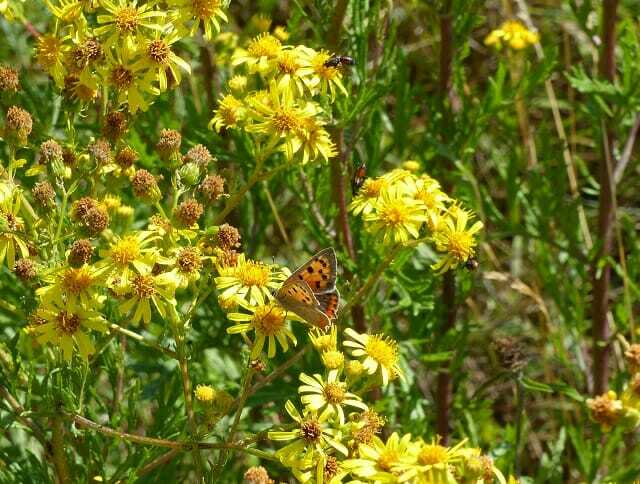 Ragwort is also a wonderful plant for butterflies, moths, bees, and other pollinators. Flowering later in the season, when many other plants have gone to seed, it is a really valuable source of food for insects. The ragwort at Sun Rising is covered with butterflies at the moment – yesterday I saw common blues, commas, gatekeepers, various whites and small coppers (shown here) in good numbers, all dancing over the ragwort and pausing to feed. As well as butterflies, there were many different kinds of bees, hoverflies and other flies. There is one moth, the cinnabar, that prefers the common ragwort to any other plant. If you look closely, you’ll find its black and yellow caterpillars on the plants now; it’ll pupate in the autumn, the beautiful black and red adults emerging in May. Yes, we do have ragwort at Sun Rising. From June until the end of the season in October we map where it is growing, so that when the meadow is cut we can remove any that would otherwise end up in hay used for fodder. A few visitors ask why we don’t just pull it out when we see it. The reality is that ragwort roots very deeply and when pulled it’s easy to break the roots, effectively increasing the number of plants. To reduce or remove it, it’s more effective to leave it to die back after it’s gone to seed and, when the soil is moist, dig it out using an appropriate tool like a ragfork. Seeds may be shed, but they more easily germinate on disturbed ground, for example, where livestock hooves leave holes in the turf. It seldom germinates in areas already thick with vegetation, so at Sun Rising you’ll see it on the edges of our undisturbed meadow. Please note, too, that uprooting any wildflower is illegal – unless it is on your own land or you’re authorised to do so – including ragwort. And don’t worry: we are keeping a close watch on our ragwort, not only to ensure that it is under control, but also to enjoy the glorious wildlife that so clearly needs and appreciates it.